"NOBODYING” is our selective hearing and seeing, it is our lack of eye contact when we dissimulate both the presence of a homeless person on the street and our own in an effort towards invisibility. The process of NOBODYING is one that denies the presence of the other and of the self simultaneously. A reality in which we dismiss ourselves from the responsibility of our actions to mask the horrifying critique of the “reality” we help sustain but refuse to acknowledge. I performed “NOBODYING” during Artscape Festival, on the Penn Station Bridge in Baltimore Maryland. 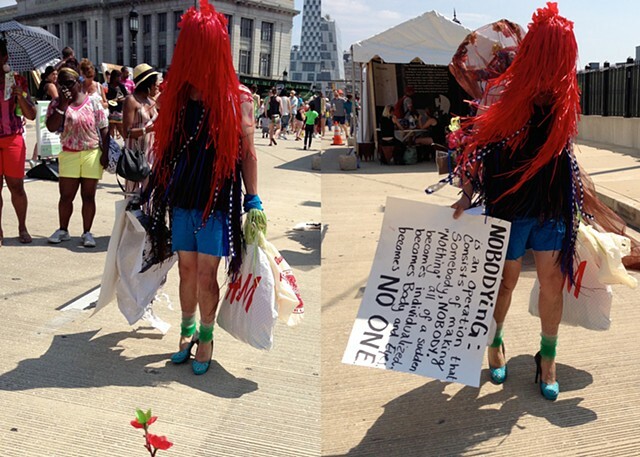 “NOBODYING”, confronted the passersby with an exaggerated reflection of our culture in the form of the aimless American shopper. Suddenly the object of mass consumption was made flesh and blood for all to consume. While wearing high heels I walked around in circles for one consecutive hour in my designated performance site. My head was adorned with a thick red wig made out of hundreds of hand sewn ribbon strips that hid my whole face. I wore a black top with hand-sewn white star-strips that I cut from a silk scarf, and blue bottoms I bought at H&M and later shortened. I accessorized with recycled plastic netting around my ankles. And on one hand I held a sign that read: “Nobodying: is an operation that consists of making somebody, nobody. “Nothing” all of a sudden becomes individualized, becomes body and eyes, becomes NOONE” a loose translation of a passage from The labyrinth of Solitude by Octavio Paz. In the other hand I held multiple shopping bags from H&M (a clothing store that promotes consumerist “fast fashion”).